If unicorns are the source of rainbows (see previous post) then eggnog must come from ferrets. If not ferrets then some other sort of small insidious mammal. (Minks, for instance. I hear they smell, too, although I may be confusing them with skunks). Ferrets are small, cute, furry, and bad tempered. I can personally attest to the fact that they bite. They are possibly also lazy, but this may be pure fiction on my part. midstream, but then what would you do with the handful? Miniature Franz West replicas perhaps? Or maybe replacement teeth . . .
Teeth made from eggnog sounds conceptually engaging: a twist on the idea of the box filled with the sound of its own making: teeth formed from the material of their own destruction. There used to be a dentist’s office in downtown Boston with a giant plaster tooth in the front window. The tooth actually looked like a lesser West at an earlier transitional phase. The first ingredient listed on a carton of Garlelick Farms Egg Nog is “high fructose corn syrup”. 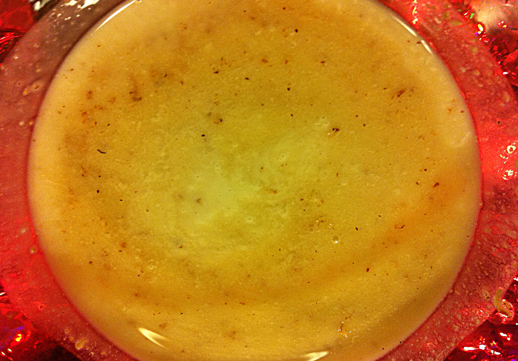 Eggnog is not the same as the (in my opinion) coyly named “milk punch”*. No eggs for one thing, or cream (but, yes, still booze). And you can’t buy it pre-made. I hear backbar has a nice version and I had a yummy one this summer at the bar at HIX. Milk punch has been around for several hundred years, as documented in recipes such as the one from the 1785 edition of Mrs.Elizabeth Price’s The new, universal, and complete confectioner; being the whole art of confectionary made perfectly plain and easy. The frontespiece promises directions for “milk punch that will keep twenty years” but the actual recipes (one for “milk punch” and another for “milk punch for present drinking”) guarantee potability for only “ a fortnight’s time”. Both recipes call for large amounts of water, milk, lemon juice, brandy, and some sugar. I am not sure whether the 20 year promise is a mis-print or a case of false advertising. The Germans have a variant of eggnog made with beer. I find this repellent but not surprising. Germans make very good cameras and bridges, but food: eh, not so much, to paraphrase Borat. Their drink is called Biersuppe and it apparently contains beer, cinnamon, egg yolks, sugar, milk and bits of bread. The proud Germans have made a number of videos detailing its fabrication (including the addition of liverwurst!!!) revealing it to be slightly less horrifying in appearance than pruno (prison wine). Even weasels shudder at the burden of association.